Another in Fashion Preserve's ongoing series . . . for more see here and here. 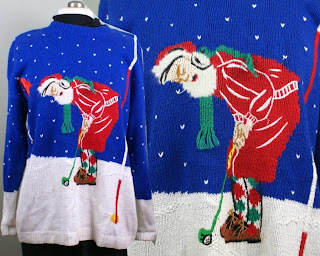 In the ugly sweater department, this one's got it all going on. Groping teddies: check. Gratuitous tartan: check. Big old bow, in case the overall lack of taste doesn't signify xmas enough: check. Brown Snowflakes: Huh? Don't eat brown snowflakes, people. Also: don't eat the brown acid, people, otherwise you're in for visions like this long, strange trip of a jumper. Oh man, the kitties with their beady eyes and jaunty caps and mangled tails . . . Mandatory warning: viewers are likely to experience double vision, nausea, paranoia, loss of libido . . . But it could be worse. Like exactly what happened below. A holiday tragedy. 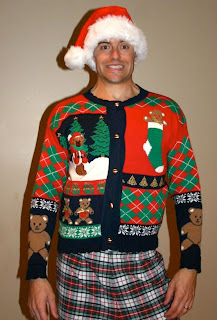 All in the line of duty this handsome model donned the xmas sweater, then made the critical mistake of looking in the mirror. Instantly, like an ancient Greek casting eyes upon Medusa, he turned to stone. Specialists are trying to revive him with round-the-clock runway videos of Jil Sander, but prospects are not good. And finally, this one. We'll start with the positives. The detail is nuttily specific, in ways (click on the pic to enlarge). Santa is wearing golf shoes suitable for the Old Course at Saint Andrews. The snow is cunningly textured--the lie of the ball is very helpfully raised in anticipation of Santa's putt. The ball is dimpled. But this brings to mind a question. Does it not look like Santa is crouched not in concentration, but in pain? As if silly Rudolph forgot to yell fore prior to driving one straight into Santa's sack? Somebody please help this man off the course, he's got work to do. And so do you, no? 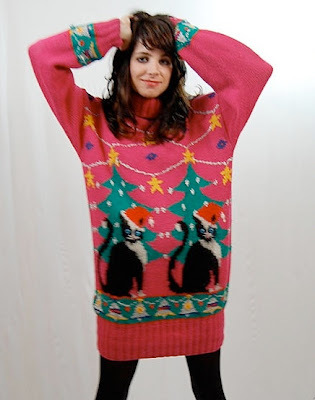 I have gone through this blog and i was wander is it necessary to make an ugly x-mas sweater or its just for fun. 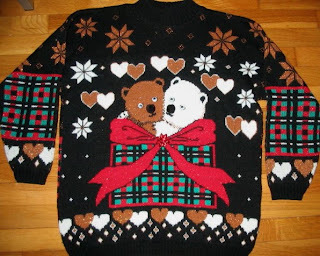 The sweater display in this blog looks ugly but some of the design made in the sweater looks great and nice. The sweater in the third picture ugly as compare with the other. Thanks for the sharing idea and a merry christmas and a happy new year. Old post, I know, but somehow happened across it. Minus the golf clothes, Santa looks like I did when I slipped a disc!